I call this colour emerald, but here in the US it’s also referred to as “Kelly green”. Orange is the colour of the season, but emerald is not far behind. I prefer emerald with shades of blue, like ink blue, French blue, denim blue and cobalt. I also love it with white. Emerald is so very fresh, and matching it with blues and white make it look and feel even fresher to my eye. Emerald is also amazing matched with purple and a bright happy yellow. I love emerald green and will wear it in any wardrobe item. 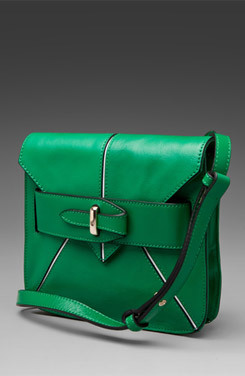 I currently have three emerald green goodies in my wardrobe: a retro jacket, a vintage handbag, and a clutch. And I have my late Mother’s vintage emerald jewelry. While it’s on trend, it is a great time to add more emerald to my style. Over to you. Do you wear this shade of green? How do you combine emerald with other colours? Will you sport emerald as an accessory? Or is it just not for you. Emerald is one of my favourite colours EVER! (sorry for shouting). And it’s pretty ridiculous I don’t have anything in that shade in my closet at all! I also love it best with shades of blue, white and purple (yellow sounds fab too). I see this color everywhere here! Love! My favorite color too! I have an emerald and mustard salwar kameez that I love – I should have it shipped over from India! I think emerald green is a beautiful colour and used to wear it a few years ago, mostly with navy, denim blue and white, sometimes denim and gray. I also wore it with black in the 80s and early 90s. Now it’s among the colours that I’ve started wondering are too harsh for me, along with apple green, orange, coral and turquoise. I fell in love with the emerald color back when preppy was oh so hot. Kelly green and blues. Kelly green and hot pinks. I wore them all. Fortunately, I can wear the color well. I still wear emerald green, although I no longer wear it with pink. These days, the color shows up most often in my accessories. I have some lovely emerald jewelry that needs to be worn more often. OK, maybe I do have one item: my bright green scarf with white polka dots. To me that shade reads slightly less saturated than true emerald, but it’s a gorgeous colour too. Kelly green and emerald green are two different colours. To my eye, kelly green has more yellow and brings up memories of Kermit the Frog. I think it has to be worn very carefully as it seems to be childlike when mixed with yellow, say. Emerald, again to my eye, is rich and deep, like the stone itself. I am having a really hard time not buying everything I see that is this particular shade of green. Which is funny, because until very recently I think I had zero green items in my closet. For the last few years everything has been sage and lime and pale greens, which I like but not as much as a true green. I love this color. The only item I have in it now is a button down shirt. Unfortunately it is pass its prime but I still cannot part with it and wear it as a layer under jackets and dresses. Do you consider it emerald? It does not have enough saturation for it in my eyes but I may be mistaken. I saw an emerald trench in ON this weekend: if it would be of better quality I would buy it in a heartbeat! Hello Angie. Green is one of my favorite colors and looks great with my complexion. I can’t wait to wear more green this Spring and Summer. Unfortunately, I can’t wear orange as it washes me out. This is a beautiful color. I bought a pair of miz mooz shoes in this shade last spring and am glad to see it is back and stronger than before. This winter I bought a soft, shiney scarf that I guess would be a dark emerald. I wouldn’t mind to see more of this colour in the shops. Now THIS is the color of my youth. I actually wore a pair of bright kelly green chinos (which looked exactly like the ones you have linked) on my first day at prep school…and never wore them again. Turns out true preppy wasn’t at all like it was explained in The Preppy Handbook. That said, I love the color but it does not love me, and it doesn’t work as an accent piece with anything else I own. I am just not a green person. Melons and oranges and yellows and browns and dark blues are more my style. I’m loving emerald green & have already bought a shirt in this fabulous colour which is really surprising as I’ve never really strayed too far from black, white, grey & red in the past. I’m seeing it everywhere over here in the UK & I am pondering a pair of wedge peep-toes from H&M for my hols. I’m loving jewel-rich tones & since I coloured my hair a few shades darker they seem to have additional punch! I think they add a great burst of energy to neutrals such as navy & black. This color screams “Springtime” to me and is thus very very welcome in the midst of a long winter. I am loving the crossbody bag. This green can’t go wrong, as long as you avoid looking like Christmas! Symbolizing balance, healing, growth, harmony, compassion…what’s not to like? I can not recall wearing the color emerald, though I have admired it on many others. Given the plethor of items that I am seeing in this beautiful shade for spring, I may have to incorporate a few pieces into my wardrobe. Love love love it!! There is some green in my very near future. Hubby shrunk my green cardi and I need to replace it ASAP! Oh I like this color. I only have dark (forest) green in my closet at the moment. I wear lots of blue so this looks like a perfect mate for some blue items. I’ll take this green color over the orange that is coming out for spring. 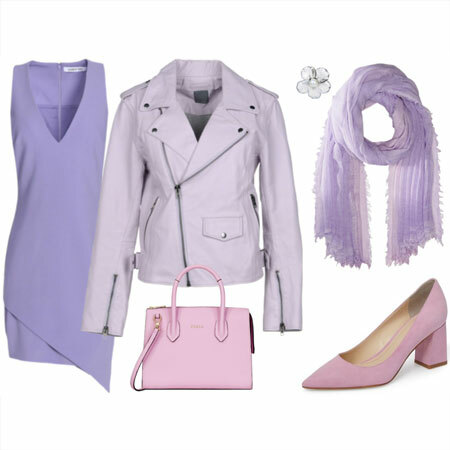 I absolutely LOVE this colour and I actually put that Gibson linen jacket on my wish list yesterday! (it also comes in petite…yippee!). I love this color. So crisp, bright, and happy. It reminds me of my college preppy days! Though I’ll be wearing it in a different way this time ’round as my style has changed. Orange is not terribly flattering on me, but this? Love! I wear pretty much any shade of green, but especially greens that don’t have a lot of yellow, so emerald is right up my alley. I love that Equipment watercolor shirt! Ah, I just purged some more from my closet, maybe I can justify it? One of my favorite colors! I wear it with several shades of Blue, Purple, Plum, Magenta.. Looking to add probably a cardi and a pair of shoes this season. You have brought back some memories from the eighties! I had a silk emerald green skirt and matching silk shell that also had shades of blue. The most gorgeous outfit ever!! I don’t think I would be so bold to wear that same outfit today, but you sure have created a desire for some emerald accessories! I want every single piece you posted, Angie! Emerald is always *in* in my book! Love, love, love!! LOVE this color! I’m so excited to see it in stores and on-line. I can’t wait to add it to my closet. It seems that it has been years since we’ve seen this color in stores. Yes, indeed! LOVE emerald, kelly, or whatever you choose to call it! (And to me, the photos you posted are definitely what I would call “kelly green” — to me Kermit is just, well, green!) I have a tote in this color that I picked up on eBay a few years ago, plus a Kelly-green-and-white polka dot scarf. I looked all over for shoes in this color last spring and only found them in designer lines at prices I wasn’t willing to pay, so I had to settle for a pair of cheapies from eBay via Hong Kong. 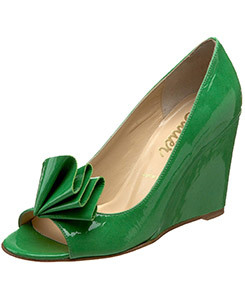 I am hoping there will be more options for emerald shoes in different price ranges this year! With Christine I would have thought emerald was a touch bluer than kelly? I have a strong dislike for kelly green but think I like emerald (though I have neither in my wardrobe) so the joke’s on me if they are the same! I love green and it’s actually a great choice for my skin tone and coloring. That Equipment blouse has me swooning, so pretty! Happy to add more of this shade to my wardrobe. I love the look of it with blues! I am not sure I can wear it near my face successfully but would really enjoy injecting some of it into my wardrobe via accessories or perhaps a pair of jeans or a skirt. It would play really well with my navy and ink blues. I knew I was starting to think green for a reason (again the fashion world had already planted this seed in my head) I love the color (in mild doses so far), but have only one sweater that I usually only wear on St. Patrick’s Day. Maybe I’ll have to add something else this year. I’m totally team orange but love the navy and green together and am slowly realizing I should get the Gap green jacket and not the red one. I was all ready to say no way (I’m a redhead and kelly green makes me feel like a leprechaun) but then I saw those shoes–Butter, what an awesome name even! I luv this color!! One of my favorite shirts that I always got compliments when I wore it was in this color, maybe a shade darker. Love it! There is much love for green this morning! Inge, a colour can make us greedy can’t it? Good point, Christine and Adelfa. I did quite a bit of research on “Kelly Green” (the origin of the name is interesting too). Some say it’s more blue, others say it’s more yellow, some even say it’s more of a forest green. For the purposes of this blog post, perhaps we can agree that Kelly green is *close enough* to emerald – in the same way that jade is close enough to emerald (although jade is more blue). Jade, emerald and Kelly green are all very much on trend no matter how you slice and dice it. I hope that makes sense! Sigrid, I wore lots of emerald back in the late ’80s too. Very sweet memories. Sveta, your jacket is definitely a shade of emerald green. More muted and blue – but in the emerald family. Emerald is brilliant with leopard print and gold. In the 80s, I had a black paisley emerald green suit, and an emerald green sweater or two that I adored. Very preppy color! They looked great with my brunette hair. After that time, it seemed to go out of fashion. When I found something emerald, it never really felt right, sort of dowdy, and I didn’t wear the items. That may be because there was very little green available in the shops up until recently, and what there was was a sage green that makes me look washed out. So, while I love the color, I’m hesitant to actually buy anything emerald, for fear I won’t wear it. I love emerald! I noticed it everywhere when I went to The Bay this week. (Just found out Macy’s now owns The Bay!) INC had some cute emerald-based patterned tops that I was drawn to. It definitely brings Spring to mind – and royalty, for some reason! Kelly green is one of my best colours. A kelly green top instantly perks up my complexion, and it’s one of the few brights I have in my wardrobe. I love it! (To me, ’emerald’ is a deeper, richer shade of green, but I love that, too). It is also a spring/summer colour for me, and I often wear it with my one pair of super-faded, pale blue jeans. 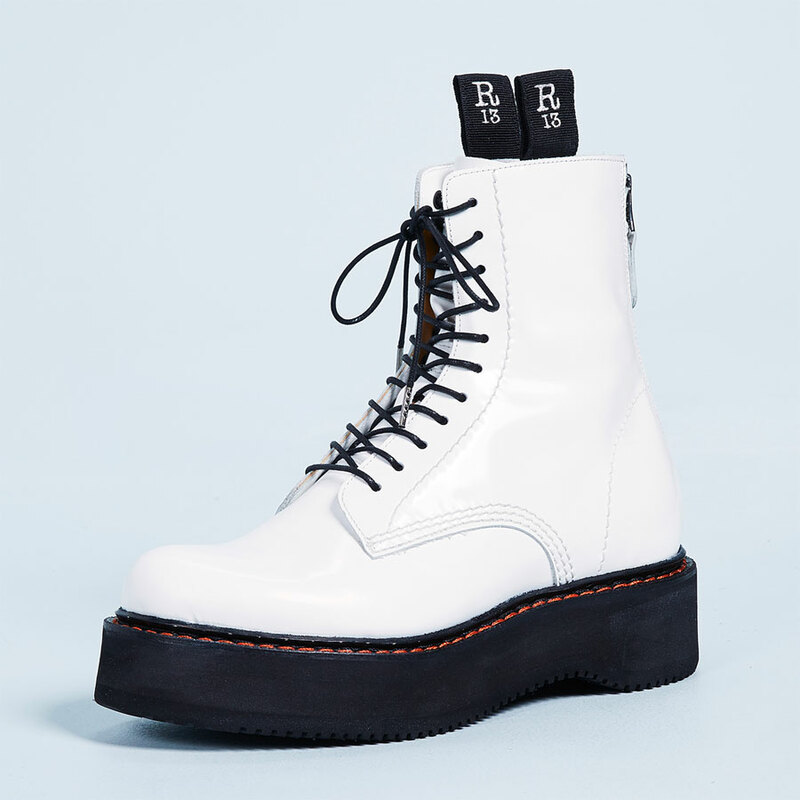 It looks good with white, too, but I usually don’t wear it with white because on me it looks too preppy, which is a vibe that doesn’t feel ‘right’ on me. Interesting about the color distinctions! I love this color when it’s very deep and verges into blue/turquoise territory. When it’s clean and vivid with a bit of yellow in it (what I would call kelly green) I associate it with traditional preppy style and don’t care for it. Also can’t handle it when it’s lighter and more pastel-y or minty–then it reminds me of traditional hospital scrubs and it becomes my most despised color evah! I guess this shade of green is tricky business for me….but I will enjoy it on others :). I love love love this green. My room was this green, with white and yellow, when I was a girl. Horror of all horrors, my dad painted over a beautiful mahogany bed for me in this green because I love it so much. I looked up shades of green on Wikipedia, and interesting enough – no color coordinates (eg, no hex or RGB) are listed for emerald green. I wonder what that means? Love this color! I worked at a dress shop once called The Emerald Isle….very fab! I really like this color with navy…very prepster. I have one emerald T that I wear a lot in summer with shorts…gonna have to keep my eye out for something new! More love for emerald! This color makes me yearn for spring. I will most definitely be on the lookout now to add an item to my closet. I just found a great pair of Blue Essence twill jean-like pants at Nordstrom in emerald green. I intended to buy them in a rusty red but when they didn’t have my size, I decided to get out of my comfort zone and buy them in emerald. Love them! So far, I have worn them with a black turtleneck sweater and black boots. Planning on wearing them with a blue chambray shirt/jean jacket when the weather gets a little warmer. A risky color for me, but I’m so glad I bought the green ones instead of the red! I love emerald and have always worn it being a redhead. I just purchased a gorgeous Steve Madden emerald bag this weekend. 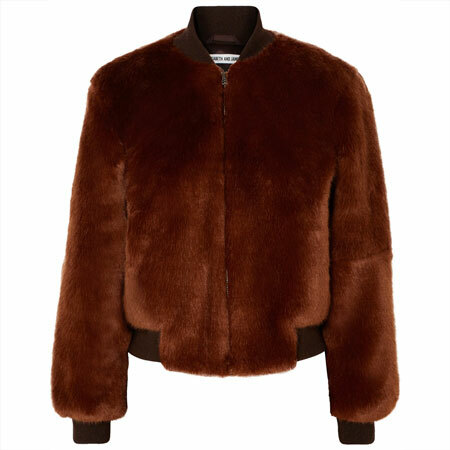 I will wear it with black, camel, navy and white of course. I love the bag. I can’t believe it is sold out! Probably a good thing. I am going to check on the the Equipment Blouse and Gibson blazer on my Nordstroms list! I think this green will be like a breath of fresh air. I prefer it muted and on the blue-ish side, like the longer jacket Sveta posted. It might be tricky to wear near my face, but I’d love to incorporate it into my wardrobe somehow! It would be so great with navy and white. I love most shades of green! Emerald and what I think of as “mallard” are two of my favorites. They work so well with yellow, blues and purples! I am not fond of this color, and when I hold it next to my face (since I never actually wear it) I look like I’m two seconds from throwing up. In other words, it does not do good things to my complexion. I have the same problem as Cindykay. The color looks great on those who are truly flattered by it, though. … have just bought a good weight(straight cut, boyfriend) cardi in a bright , emerald green (I don’t know why, but this colour captured my attention and my love at first sight as beeing easiest to match my own items). It has navy elbow patches(!!!) so I thought on my very own (before reading your great post here:-) to wear it with a light blue chambrais shirt/white tee and navy chinois pants(or dark ink blue jeans). I love emerald! I think of it as a deeper, more jewel-toned shade than kelly green for some reason, but I’m probably be wrong. I am THIRLLED to see it all over the place – I’ve been waiting forever for it to happen. Yes! Count me in as someone who would live in the Emerald City! Your photos are so beautiful and fresh and I would love any one of them, particularly the handbag and scarf. I know I love this green and it loves me, because I recently bought an emerald green shirt and while I was waiting to get another size, a woman came in with her SA, and said “I want that one she’s wearing” and she said to me, “I’m buying this, because of the way it looks on you.” Not only did I get a beautiful new color that felt instantly good, I also left with a nice compliment from a shopping stranger. I like this trend! To add on to the color name nuances, our high school *colors* were kelly green and white and most of us thought it was too bright at the time or not the right hue, and we would have preferred the more understated forest green. But, it got us through high school with good memories. I like (not love, but like) the color. That dress in the second row of pics is so pretty! I have cute flats in what I refer to as “kelly green”. The color is a bit richer and darker than most of the items pictured, so I’m not sure it still counts as emerald. I like to pair them with blue and white denim. I would LOVE a pair of emerald earrings. Thanks for brightening a grey Monday morning with a lovely burst of spring color! I currently don’t own anything in this color, but I would be much more inclined to add emerald accents than orange for a springtime wardrobe update. I do not have any of this shade in my wardrobe now but I believe it is blue toned enough to work with my skin tone so I am not opposed to the right item following me home. I do like this green, but being bright-color phobic I’m a little afraid of it! In general, I stay away from bright jewel tones (cobalt, bright red, etc.) because they wash me out. I currently don’t have ANY green in my wardrobe, but I have LOTS of blue and denim…so I could see how this color might work with my wardrobe in small doses. 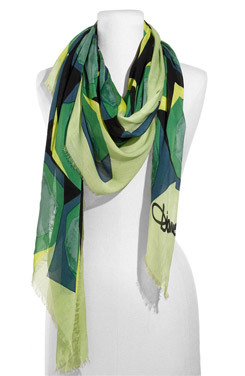 I might have to take on this color in baby steps, thought, like the DVF scarf. I’m with Jonesy on this one. Not my favorite shade of green, and I love, and wear, most all greens. It borders on the scrubs color to me, as well. Put me in the camp who also thought emerald was much deeper toned, like the jewel itself. I have a number of items in this shade of green and don’t mind adding more. It is such a vibrant color that it gives me energy when I wear it. It also goes well with jeans making them stand out. So yes, I’m all for it! LOVE this color. I’m holding out for a bag in emerald. I love this color and it is great on me…yeah! Oh, scrubs! That’s hilarious, Jonesy. I see seafoam as the colour of scrubs – much more mid toned just as you suggest. Although these days, scrubs come in all sorts of patterns and colours, don’t they? I really like this color and have several pieces. Shades of green is the most represented color in my wardrobe! I love your examples!! As a redhead, I’ve been pushed by others towards kelly green for much of my life and don’t really like to wear it. I actually feel as though it’s too bright for me; I prefer to sport more muted, “broken” colours like a soft yellowy browny green. That said, I think it’s a GORGEOUS colour to look at and will relish seeing it on others. I LOVE emerald green! It’s probably my favorite color and I’m so happy to hear that it will be around in quantities this season. That Equipment blouse is gorgeous and I have been considering getting it. To my eye there is a difference between emerald and kelly green. The shoe on the left looks emerald and the shoe on the right looks kelly to me. I haven’t worn this shade of green since a sweater I owned in the mid 90’s. However, I would definitely wear it again and will be on the lookout for an emerald green top. I like it – but don’t love it. If it has a blue undertone and is not quite so bright, I could see myself incorporating it into my wardrobe though! I would love to have a pair of shoes or a handbag in this color! I only have a couple of scarves in Emerald, but with my coloring (dark hair, fair skin, blue/green eyes) I really should wear it all the time. I will be on the lookout for that just-right emerald or dark teal jacket this spring/summer. I, too, love greens and blues together. The colors of the sea. I find this combination soothing and peaceful. well, most greens don’t work for me (with the exception of some forest greens), even though they are lovely in the abstract. interestingly enough, i can wear actual emeralds (but can only afford some tiny ones in a pair of studs!). i have trouble shopping in the green years…..but perhaps that’s all for the best at the moment. I love this color, but it doesn’t love me. Even hubs said right away that the color made me look ill. Still, I hope to fake it a little with my jade green dress. Yes to emerald! It matches my eyes! I love this color and I think I can wear it well, so I’m definitely on the look for some emerald green items. Yes, I love emerald green. I have a top with blues in it and a scarf as well. I’ll be looking to add some pieces to my wardrobe this season. I don’t wear green unless it’s emerald. Those peep-toe wedges would be the most PERFECT pop of color for an outfit. i love this color. i have only 1 item in this..a washed silk sequined tunic. no plans to add more, but i will be wearing the heck out of my tunic come spring. Yay for emerald green! I felt more attracted to orange but after trying on orange and emerald green, feel the latter is easier to wear. Lovely colour. Dipped my toe into the trend last year with a cross body bag worn with dark denim, navy and white stripe top and white jacket. Angie, I am going to try it with a yellow coat as per your suggestion for colour combos. Also have an Lululemon tank in this colour that I wear with a white tennis skirt and a hot pink jacket when I hit the courts. Always feel happy and kind of “preppy” in it. The emerald silk dinner suit will remain in the “dress up box” where it belongs even though I saw a photo of Jessica Alba sporting a similar green tuxedo jacket sans the giant shoulder pads recently. I’m with Antje. I like emerald green but don’t love it. The last emerald green item I bought was back in the mid-1980s. It was a belted wool Mark Jacobs blazer, which I wore with his over-scaled print houndstooth mini in black & white. Loved them both, but I think it was the cut of the jacket more than its color that drew me to it. I feel like emerald green is one of those colors that wears me, rather than the other way round. I would be much more inclined to add emerald to my wardrobe in accessories, like a scarf or bag. In fact, I do have a lovely Anthropologie scarf in emerald, but struggle to find things to wear it with, since it’s so bold. Yesterday at J.Crew, where I was trying on the Polly Popover tunic—which I ended up ordering in black & white—I was attracted to a darling emerald crossover bag. This I could see myself getting some use out of. I have one emerald sweater and plan on adding much more to my wardrobe this season! This is not my color at all, but one of my favorite shirts was in the shade shown above and I get compliments every time I wear it with my white suit. But it is the only piece of clothing I have in my closet in that color and I wouldn’t have bought it if I had another choice. Oh goodness, I would very happily wear emerald green. Green in general is a shade that I’m told is not flop-proof on me, but emerald is one of the shades that does work. 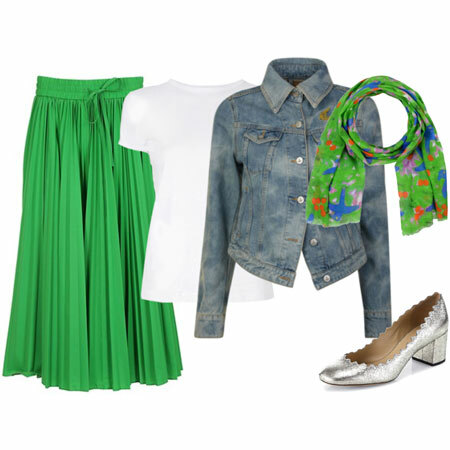 An emerald top with denim or white clams could so easily be a summer go-to. To me there is a slight difference between kelly and emerald and I have a preference for Kelly. Love some of these finds! Mostly no, I don’t go for this color. 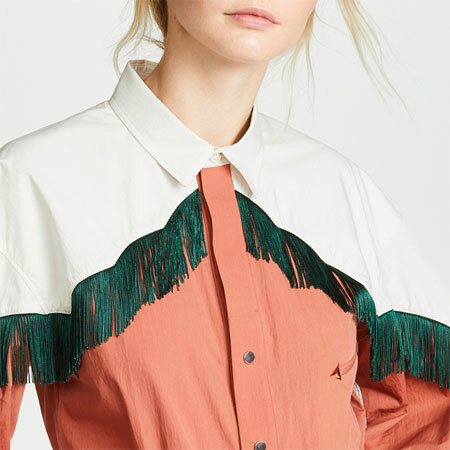 I think it reminds me too much of Girl Scout uniforms — and I was a girly girl in a troop of outdoorswomen as a Girl Scout. I do love green, and some shades of it I think suit me well. Come to think now, I had a wonderful silk shirtwaist in raw silk in this shade, and I really did like it — but I was a brunette then, and graying has lessened emerald’s appeal for me, I think. I really like both kelly and emerald green but certainly wear emerald much better than kelly. I don’t have anything in kelly, and only a few items in emerald (a rain coat and a graphic tee). I bought a lot of bright orange last spring, so I’m hoping to get myself a couple emerald items this spring! I would love a pair of kelly green jeans (it’s one of my MUST GET items for spring), and an emerald silk scarf would be a wonderful addition as well. I would also really like to find a dress or skirt in emerald! I haven’t seen a lot of it in the few stores I’ve been to recently, but can’t wait to get more time to go out and look for it! It really is a lovely color…and one I’ve never worn! I’ve been contemplating a foulard blouse in indigo, but it also comes in clover. I may go with the green instead. My new ASOS coat is this color! It’s been interesting to read the comparisons to orange, that some feel it’s easier to wear emerald than a shade of orange. I guess that makes sense! I love this color but am not sure that it loves me back. Long ago I had my colors “done” and was told to wear about every shade of green. In practice they are just ok, I think, but I will try again. It may be that just the right saturation and hue will turn up. I suspect that my love will turn out to be Kelly rather than Emerald. I’m always attracted to prints with green, red and blue. I truly love green…virtually all shades…but I especially favor a fresh clean spring green, as well as any blue greens. Olive and emerald, too, though true emerald can be just a tad harsh or intense, but still, I love it. Green makes me feel alive. I was very fortunate recently to inherit a completely stunning emerald ring. It has wonderful sentimental meaning and it is a real show stopper to boot. green has been one of my recently purged wardrobe colors! Oh no… I think I have a single green and white shirt left. Probably enough to enjoy since the purge was for colors I don’t think look great on me. Not a colour I wear easily, but I’ve always hankered for a Kelly-green handbag! That said, the sole emerald outfit I possess is green from head to toe! It’s an Indian saree and works for me because of the black borders and ‘end’ pieces, which are the bits that actually go against my skin. I had the same green with white in another outfit, but never wore it because I thought it made me look too sallow. Emerald is definitely an 80’s color. The house I grew up in was carpeted ENTIRELY WITH EMERALD GREEN! My mother still loves this color. We had it with yellow and white with some brown mostly. I can see it with black, or navy, another great 80’s combo. I really love that green bag! This reminds me, I have some yardage of emerald green lightweight wool from the 80’s (I keep stuff a long time!) Maybe a new jacket! I have just one item in my closet right now. This is not right. I found it’s a shade I really need to test in real life. Several years ago I got an Anthro cardi online and it wasn’t what I expected. It’s wearable I think, but something about the underlying hue and intensity is not quite right. I really like this color with blues, white and yellow. Emerald or kelly green with blue is sublime – it makes me calm and happy at the same time. I’m confused about classification of what’s kelly green and what’s emerald green. Whatever they are called, I like them when I seem them. I love emerald green! I have a blouse, a blazer, and a cardigan all in that color. I love orange and ink blue too so I guess I can hop on all the latest spring color trends! Green is my least favourite colour in the rainbow, but I’d DEFINITELY wear Emerald Green!